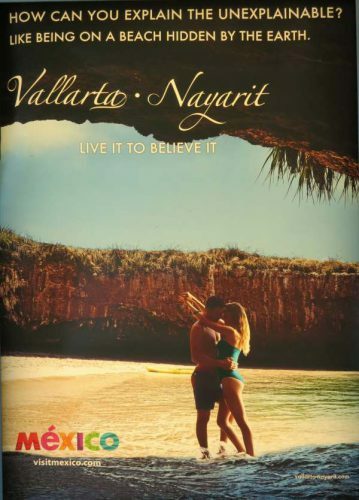 In the past couple of years, Mexico’s federal tourism department has included a truly magnificent beach on some of its publicity posters. It is one of those advertising posters that really catches the eye. I first saw a poster featuring Playa Escondida (“Hidden Beach”) in a departure lounge at Vancouver’s International Airport and spent the next hour watching people’s reactions as they passed it. Several people paused and studied the photo, demonstrating its success in capturing people’s attention. The beach concerned, also known as the “Beach of Love”) is on one of the small, uninhabited Marieta Islands, in the Marieta Islands National Park, off the west coast of Mexico, and relatively close to Puerto Vallarta. 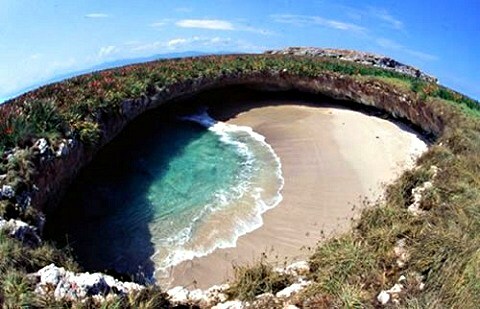 The posters, and resulting publicity, have led to so many tourists wanting to experience the beach for themselves – more than 2500 visitors a day during Easter Week this year – that Mexico’s National Protected Areas Commission (Conanp) has ordered the beach closed for at least three months due to concerns about environmental damage. Conanp has indicated that the local coral reef has already been adversely impacted by tourism. Conanp’s decision follows a study by scientists at the University of Guadalajara which concluded that tourism has led to the death of coral, accumulation of garbage, and to pollution from hydrocarbons. The study estimated the beach’s environmental carrying capacity (the number of people that could visit the beach without causing lasting environmental damage) to be 625 visitors a day. Given the secluded nature of this beach, its perceptual carrying capacity (the maximum number of visitors that other visitors can tolerate, based on such impacts as noise) may be even lower. To assuage some of the economic concerns of tour operators, Conanp is making plans to open a different beach on another of the Marieta Islands for tourism at some point in the near future. During Easter week, there were numerous press reports that boats ferrying people to the Marieta Islands from El Anclote, Nayarit, were often overcrowded and carrying more passengers than their permits allowed. Boat owners, not surprisingly, deny this, and claim that this is yet another attempt to dislodge them from their remaining toehold on Punta de Mita, where a major upscale tourism development forced many fishermen out of their homes about thirty years ago. For details, see the text accompanying our Map of the Beaches of Jalisco. The number of tourists traveling to Playa Escondida increased from 27,500 in 2012 to 127,372 in 2015. While the federal tourism poster was not the only publicity given the beach, it certainly appears to have played a part in increasing public awareness of this scenic geotourism location, ultimately resulting in the need to make it off limits for tourism, at least for now. We discuss the consequences of tourism, good, bad and neutral, at length, in chapter 19 of Geo-Mexico: the geography and dynamics of modern Mexico. Buy your copy (Print or ebook) today!